3세대가 함께 거주하는 미니아파트입니다. 독일건축가 BETA가 암스테르담에 설계한 하우스의 각층을 연결하는 노란색 내부계단은 주거내부를 수직으로 관통, 물리적인 동선역활과 심미적인 디자인 어휘를 표현합니다. 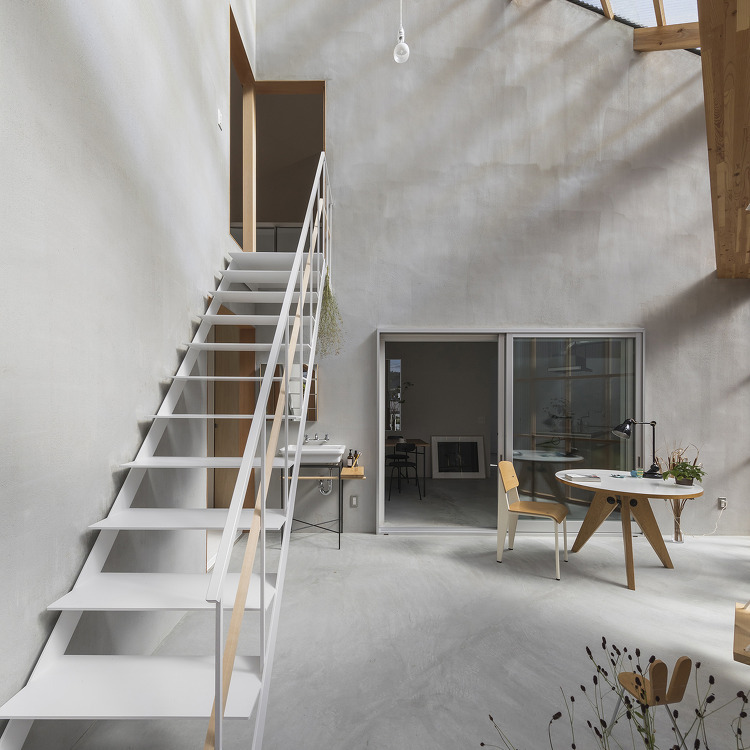 Dutch architecture studio BETA has built a house in Amsterdam for a multi-generational family with a central yellow staircase connecting their separate accommodation.BETA designed the Three-Generation House for a couple with young children who already lived in the city, and their p..
아르헨티나 지역 건축가 Felipe Gonzalez Arzac가 디자인한 하우스는 콘크리트 물성의 적나라한 모습을 볼 수 있는 담백한 집입니다. 탈형된 거푸집의 흔적을 지우지 않고, 디자인 요소로 사용된 모습을 볼 수 있습니다.풍부한 외부자연환경과 대비를 이루는 직사각형태의 건물은 내부로 수렴된 중정형 평면이 특징입니다. 외부의 극단적인 미니멀한 디자인과는 달리 중정으로 면한 내부는 전창을 이용, 막힘없는 열린 공간으로 구성되어 있습니다. A plant-filled courtyard and a long swimming pool feature behind the board-marked concrete walls of this residence in La Plata, Argentina, designed by..
내부와 외부를 연결하는 일. 적절히 외부환경을 필터링하여 내부로 유입시키는 역활과 내부공간을 외부로 확장하여 개방감을 높이는 일은 세미 아웃도어 공간을 통해 구현한다. 내부의 기능적인 동선과 프로그램 수행 또한 동시에 수행한다. 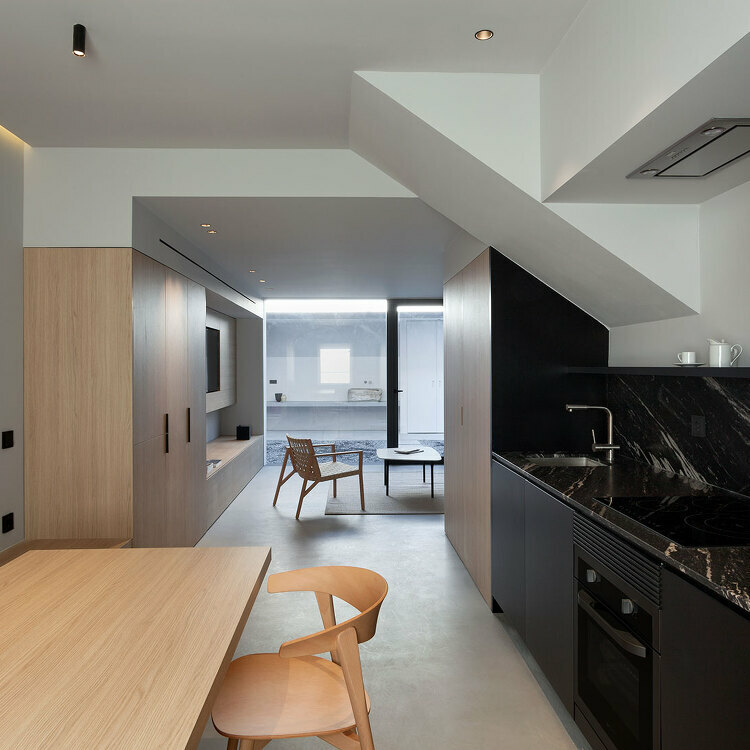 House in Sonobe is a minimal home located in Sonobe, Japan, designed by Tato Architects. The home is characterized by a sunroom that opens up to the outdoor garden via a large corrugated polycarbonate wall. The architects wanted to include a variety of semioutdoor space..